Weekend warriors in suburban basements, basketball stars who are also ethnic icons, ex-cons on the streets of New York—masculinity comes in many forms. While we didn’t set out to publish a masculinities issue, our summer features have converged on this theme. In the cover feature, Scott Melzer introduces us to men who participate in fight clubs in suburban basements—from the macho dudes we might expect, they are often suburban dads, geeks, and even college professors. What motivates them to fight? We invite you to read on and find out. And does the success of Chinese-American basketball star Jeremy Lin challenge the “model minority” myth? In his exploration of the meaning of Lin’s popularity, Maxwell Leung shows us the complexity of “Linsanity.” Myths of masculinity are also at play in Victor Ray’s look at how battle-related mental health issues affect veterans at home. Expected to handle post-battle pressures without complaint, these men are often stigmatized for seeking help. Men re-entering society after incarceration fare no better. There is increased attention to programs that might prepare the prisoners for life after confinement, but communities remain ill-prepared to receive ex-offenders. Journalist Sabine Heinlein includes us in her dinner with Bruce as she investigates his re-entry experience. Turning to media violence, Cynthia Chris looks at media that make us feel queasy, and Moon Charania argues that Django Unchained should make us far queasier than popular acclaim suggests. In Viewpoints, five experts comment on the promises and realities of charter schools, asking who they benefit. Edwin F. Ackerman looks at the rise of the term “illegal alien” and the public campaign to expunge it from mainstream news media, while Marcus Hunter examines why black gays and lesbians seem more reluctant to support marriage equality than their white counterparts. Jeff Manza reviews three new books on class warfare, and Lisa Stulberg looks at two tomes on the making of adolescent elites and conservatives. And, on a lighter note, Joshua Gamson interviews his parents, sociologists Zelda and Bill Gamson. This issue also marks our half-way point as Contexts’ editors. It’s a time of excitement and transition. We offer our thanks to Kari Lerum, who is stepping down as Mediations Editor, and Arvind Rajagopal, who is moving on from his position as Book Review Editor. Karen Sternheimer and Matt Wray will joining our team in their stead, taking on Mediations and Books, respectively. We’re so pleased to have them on board. Associate Managing Editor Jennifer Hemler is also moving on to new adventures. We have benefitted tremendously from her quick editorial wit and excellent eye for images. She will be missed. We welcome Jessica Streeter in her place (and look forward to lubricating our operations with some of her homebrewed beer!). Finally, we congratulate Managing Editor Carly Chillmon on becoming a new parent. While she is on leave this summer, we’re fortunate to have the services of Letta Page, former Contexts Managing Editor extraordinaire. Over these past issues, our bi-coastal operation has become smoother, thanks mainly to the excellent teamwork of our staff, department editors, and dedicated editorial board. 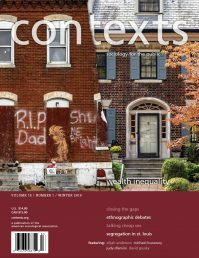 We’ve been pleased to work with enthusiastic authors, generous reviewers, and engaged readers who share Contexts’ vision of public sociology. Onward!